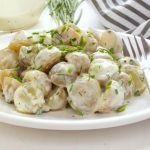 This healthier potato salad is lower in fat and calories than traditional full-fat potato salad recipes. The secret is using low-fat buttermilk in the dressing. To a large mason jar add the buttermilk, yogurt, mayonnaise, lemon juice, salt and pepper, and Dijon mustard. Finely chop the scallions, the basil and the garlic. I find a garlic press works great for adding garlic to salad dressings. Add them to the mason jar, shut the lid very tightly and shake it all up for about 1-2 minutes. You can blast some music or do a funny dance while you do this...whatever makes you happy. At this point, stick it in the fridge and forget about it for at least 2 hours. I often make this dressing 24 hours ahead of time which allows the flavours to blend nicely. Wash and halve 3 lbs of baby potatoes (I used both yellow and red potatoes, but you could use just yellow or just red, or whatever you want, really). Personally, I prefer to leave the peel on potatoes when making potato salad for several reasons: it increases the amount of fibre, it helps the pieces of potato stay together, and it gives the potato salad a beautiful, homemade, and rustic look. I also loathe peeling potatoes, so there's that. Once the potatoes are washed well and halved, stick them in a large pot and add enough water just to cover them. Add the pot to the stove on medium-high heat and wait for the water to boil. Once the water begins to boil, turn the heat down to medium, cover the pot and let the potatoes cook for about 8-10 minutes. You'll have to check on them every few minutes to make sure they don't over-cook. You'll know they're done when you can pierce one with a fork without too much force but all the pieces are still intact. Use a colander to drain the potatoes and rinse them under cold water until they cool to room temperature. Once the potatoes are cool, be sure to let them dry for a few minutes before assembling the salad. If your potatoes are wet the dressing won't stick to them and you'll end up with a mess. The best way to do this is to lay them out on a clean kitchen towel for a few minutes. While you're waiting, chop the fresh dill into pieces small enough that the taste isn't overwhelming but big enough that you can still see the lovely wispy bits. Add the potatoes to a large bowl and add the dressing. Toss the potatoes until they're well coated. Add the dill and toss gingerly just until you can see the tiny sprigs of dill throughout. If you're serving this dish at a dinner party or to a crowd, now's a good time to transfer it to a clean bowl. Tossing the salad in this creamy dressing creates quite a mess. Garnish the top with some chopped fresh chives, and refrigerate until you're ready to serve! When making homemade salad dressings like this it's always best to make them a day or two ahead of time to allow the liquid ingredients to fully absorb the flavours of the herbs.